Events in Scotland and France are being held to mark the centenary of the Battle of Arras, in which 18,000 Scots died. Of the 120 battalions that took part at Arras, 44 of them were Scottish. Descendants of troops are joining schoolchildren from across Scotland and dignitaries for the commemorations at Arras. Arras was fought from 9 April to 16 May 1917 and marked the beginning of the spring offensive on the Western Front. The Allies suffered 159,000 casualties, including 46,000 Scots, during the offensive. 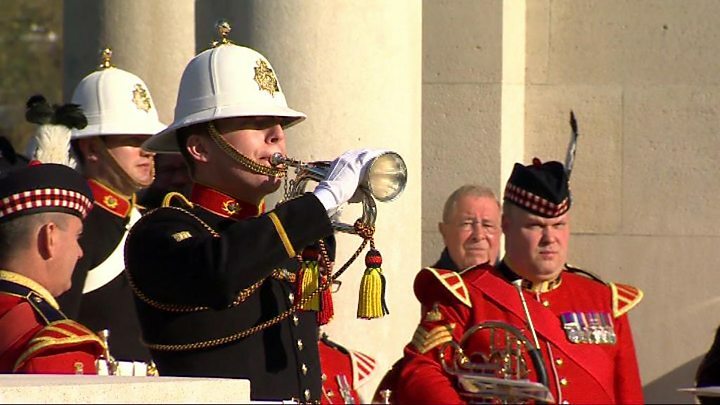 The moderator of the Church of Scotland conducted a service at Faubourg d'Amiens Commonwealth War Graves Cemetery in Arras, which also saw the Royal Regiment of Scotland band conduct a Beating Retreat in the Place des Heros. Wreaths were laid by Lord Llewellyn, the British Ambassador to France and Vice Admiral Sir Tim Laurence as well as Prof Norman Drummond, chairman of the Scottish commemorations panel. In a symbolic gesture, a school pupil from Scotland and one from France laid a wreath together on behalf of the UK, French, Canadian, New Zealand, Australian and South African nations who fought in the battle, while singer Amy Hawthorn from West Lothian led the singing of the national anthems. About 60 to 70 people gathered at Greenock's Wellpark war memorial on Sunday morning, with bright sunshine and birdsong the backdrop for this Battle of Arras commemoration. It has been a century since 18,000 Scots died during the action. About 100 of them from the Greenock area are remembered on the Arras War memorial in France. They were people like you and me - they worked in shops, factories and offices. They had families, they had dreams of their own. But that was all taken away from many of them on the bloody fields of France. Two of those at the Greenock service were Margaret McCready and Heather Ferrie - the granddaughter and great-granddaughter of Private James Cook of the Highland Light Infantry, who died at Arras. They never met him. All they have is a picture, and the memories of others. It was important for them to pay tribute to Private Cook's actions, and to the thousands of his comrades at the battle who never came home. Also attending the event was First Minister Nicola Sturgeon, who paid tribute to those who fought in the offensive. She said: "Pupils representing every local authority in Scotland are in Arras this weekend to learn more about its impact. "These young people are not much younger than many of those who fought in the battle - many of whom never returned to Scotland. "Education is an important part of our commemorative programme - ensuring pupils understand the impact and significance of the battle, and share what they have learned with their peers and wider community." Among those attending the event in Arras was the moderator's wife, Margaret Barr. She laid flowers on the grave of her great uncle, David Wyllie, who lost his life in battle at the age of 29. Born in 1888 and the eldest son of Robert and Jane Wyllie from North Berwick, David was fatally injured by gunshots during the six-week offensive. The commemorations also saw dozens of people gather in Greenock to remember those who died in northern France. They held a short service at the Well Park memorial, which was attended local politicians and veterans. In Edinburgh, a service will take place in the Scottish National War Memorial, followed by a Beating Retreat by the HM Royal Marines Scotland band on Edinburgh Castle Esplanade. Joining the commemorations in Edinburgh will be Margery Mackay, whose Uncle Donald also fought in the battle and died on 28 April 1917 after being caught in an ambush. He had joined up in September 1914 and went 31 months without leave before he found himself on the front line in Arras. She said: "It was only after the loses in the Somme that the regiment was moved to Arras." Mrs Mackay became interested in his story after finding and reading his last letter home. She said: "He seemed to be just an average ordinary man of the day, who really felt that they had to go and fight. In his letter he talks about his family and really seemed to care for them." She added: "I really don't think they knew what they were getting into and they ended up in such horrific conditions, but in his letter he talks about being in the army for 31 months, not having had any leave and that his conduct was good. "He still sounded quite sane and he still sounded as if he was prepared to do his duty and I just feel this is almost like a last chance to remember him."